COLD SPRING, MN – Cold Spring Brewing Co. (CSBC), leading beverage producer for major retailers throughout the world, is pleased to announce that Third Street Brewhouse, the company’s craft beer division, will be moving their line of craft beers to 12oz cans available in 12-packs. This marks a significant shift from the current 16oz, 4-pack packaging available today. Available in stores now are fan favorites Hop Lift IPA and Hunny Do Wheat Beer in 12oz cans. Hop Lift IPA has been one of Third Street Brewhouse’s most in-demand beers since it hit shelves in 2016. Hop Lift is a bold India Pale Ale brewed with over 600 pounds of hops in every tank. 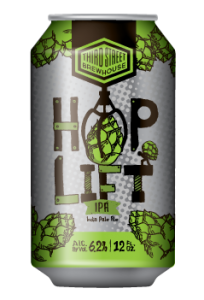 To create Hop Lift’s distinctly hoppy flavor, Third Street Brewhouse brews it with a blend of Ekuanot, Glacier and Bravo hops. Hop Lift is available year round and has an ABV of 6.2%. Hunny Do Wheat Beer is a hazy wheat beer brewed with honeydew melon flavor. This summer seasonal beer is available annually starting in early spring through July. Hunny Do is a refreshing wheat beer with a crisp and subtly sweet hint of honeydew melon. Hunny Do is available seasonally and has an ABV of 4.8%. Hop Lift and Hunny Do are now available in their new sizes and Third Street Brewhouse plans to release a few other beers in the new size later in the year – Free Speech, Oktoberfest and Sugar Shack will be available in 12oz cans and 12-packs beginning in late summer and fall of 2019. Sun Seeker Shandy, another Third Street Brewhouse summer seasonal brew, will also be hitting shelves to help us kickoff spring and some warmer weather. This light, refreshing brew with a hint of lemon is available annually starting in early spring through August. Look for Hop Lift, Hunny Do and Sun Seeker Shandy in 12oz cans and 12-packs available now, and find other Third Street Brewhouse favorites in stores and on tap now.